We believe that life is a gift from God. Each person's life is of great value and deserves respect in all stages, from conception until death. We are committed to respecting each person as an irreplaceable member of the human community and as a unique expression of life. The purpose of Crosbyton Clnic Hospital is to provide quality health care services, which contribute to the well being of the hospital's rural service area. All those associated with our hospital service are committed to treating patients, there families , other hospital guests and each other with dignity and respect. Each patient who enters our hospital facility is served by competent, caring and helpful health care professionals. 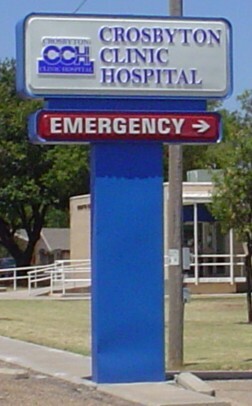 Crosbyton Clinic Hospital symbolizes quality personal care in a caring environment. Brooks Ellison Debra Miller Steve B. Alley, M.D. Crosbyton Clinic Hospital's dedicated employees take pride in the ability to deliver high quality healthcare services to the residents of Crosby County and the surrounding areas. At Crosbyton Clinic Hospital, our patients, family members and visitors come first. Our goal is to best meet the needs of those seeking our care, whether as an in-patient stay, out-patient visit or stabilization and transfer to specialty service in Lubbock. Not only does the staff of Crosbyton Clinic Hospital take pride in our facility, but we also desire that each resident of Crosby County and surrounding areas share in that pride of their healthcare facility and staff, providing compassionate and dedicated care to their neighbors and friends. On behalf of the Crosbyton Clinic Hospital staff, Crosbyton Clinic Hospital Board of Trustees, Medical staff and all services and support, we thank you for choosing Crosbyton Clinic Hospital to provide your family's health delivery.